Many of us look ahead to the new year and think, “I hope this year is better than last year!” While I understand the impulse to do so, we need to remember this: everything that happened last year happened according to God’s plan for us, even if his plan didn’t correspond to our own. Therefore we can be grateful even for the hard times, because God used them for our good. John the Baptist provides a great example to help us have a better year in 2016. He reminds us to stay focused not on what we want—on our plans and desires—but on what God wants. We should be so focused on his agenda that we don’t have much time to worry our own! I can tell from Facebook that many of us have made New Year’s Resolutions. Indeed, early January is the time when gyms across the nation pay the bills for the other eleven months of the year. Because in January we resolve to do what most of us resolved to do last year but failed. And what we resolved to do the year before that, but failed. And what we resolved to do the year before that, but failed: which is, to finally get in shape! So we join the gym in January. And we go many times in January. And we go a little less in February. And March… even less. One of my Christmas gifts that I asked for this year, and received, was running clothes for cold weather—and finally, on Friday for the first time this winter, it was cold enough to wear them. The outfit is made of this stretchy material that is form-fitting. Unforgivably so! When I put the shirt on, and looked in the mirror, I said, “Oh, my goodness, when did I become the Michelin man? I have to wear a baggy T-shirt on top of this.” So I’ve resolved to get in better shape in this new year. Well, I agree that you and I and everyone else in the world have sinned—badly—over the past year. We often failed to do what God wanted us to do. God certainly didn’t want us to sin; that was our choice; and we’re responsible for that. But, see, God already knew—before he even created you and me he knew, before he even created the world he knew—he knew that you and I and everyone else in the world would make the ignorant, foolish, and sinful decisions that we made in 2015. So what we chose to do didn’t catch God by surprise. And because of that, he was able to account for those choices—to work around them, to work through them, indeed, even to transform them—to transform all the bad stuff and use it in a way that helps us. And even if we’ve been disciplined by God for our sin, how can we not be grateful even for that? And this is true not only for our sinful choices and their consequences, but also for the bad stuff that happens to us over which we have no control. Can I be grateful even in the midst of this illness? Can I be grateful even though I got laid off? Can I be grateful even though this relationship is falling apart? Can I be grateful, even though my loved one died? And the answer is, yes—if you’re a child of God, yes. As theologian Andrew Wilson said, paraphrasing several passages of scripture: “Suffering produces perseverance, and character, and hope, which does not disappoint because the love of God has been shed abroad in our hearts by the Spirit. It is “in all these things”—persecution, danger, nakedness, sword—that we know nothing can separate us from the love of God. It is through sufferings that our comfort abounds in Christ, and through [God’s] discipline that we know we are legitimate children of God.” He is able to transform adversity into something good because he is almighty God; he desires to do this because he is a faithful Father. If you are a disciple of Jesus Christ, hasn’t this been true in your experience? Maybe this describes you. And for all I know, 2016 will go just the way you want it to. Everything will go your way, and you’ll be happy. I mean, I doubt it, but it’s possible. But wouldn’t it better if you had a kind of happiness, a kind of deep and lasting happiness, a kind of abiding joy, that was bullet-proof, that didn’t vacillate depending on external circumstances, that wasn’t affected by whether or not things were going your way? Don’t you want the kind of happiness that lets you “rejoice in the Lord always” and be “thankful in all things”? I certainly do! And I believe that John the Baptist gives us an example of how to have that kind of resilient happiness and joy. After all, John is not a man who would look back on yesterday, or last week, or last month, or last year and complain that things didn’t go his way. Because he doesn’t seem to care at all about things going his way—even when things are going his way. I mean, at this point in John chapter 1 he’s attracting large crowds of people. He has disciples who are following him. He’s famous. He’s respected. He’s adored. Powerful and important people—society’s movers and shakers—are coming out to him in order to be baptized. But here’s the thing: that’s exactly who John the Baptist is—he’s the Elijah-like prophet that was supposed to come before Christ and call people to repentance. Jesus said so himself in Matthew 11:14: “If you are willing to accept it, [John] is Elijah who is to come.” Jesus also said of him, “Truly, I say to you, among those born of women there has arisen no one greater than John the Baptist.” So up until Jesus, John was the greatest person who ever lived—according to Jesus. Yet John could say of Jesus, “I’m not worthy to untie the strap of his sandal.” Untying the strap of a sandal, by the way, was something that only a slave would do. John is saying that in comparison to Jesus he’s lower than even a slave. When I consider this kind of humility, I think to myself, “I am so unlike John the Baptist.” See, in comparison to John, I’m even less worthy to untie the strap of Jesus’ sandals, but is that how I usually act? No! When I serve Jesus, I can hardly do so without wanting to hold on to just a little bit of glory for myself! This is what my sinful heart always tries to do… In fact, when I think about it, so much of my unhappiness in life is related to not getting the glory I think I deserve—as if I “deserve” anything from the One whose sandals I’m not worthy to untie! But I do think that when I’m unhappiest, it’s because I’m not getting the glory. For example, why do I spend too much time worrying about what other people think of me? Is it because I’m afraid if they don’t like me, and they gossip about me, they’ll rob me of some of my glory? And why do I struggle to be happy for colleagues of mine who are more successful than I am? Is it because I’m jealous of the glory that they’re receiving—which I’m not receiving. And why do I get my feelings hurt so easily? Is it because someone has said or done something to me that diminishes my glory? At my sinful worst, I want glory so badly—and it just kills my spirit! Surely I’m not the only one, am I? So, no, I’m not like John. Because he couldn’t care less about his own glory. Why is that? And how can I be more like him? I saw a movie last week that helped me figure it out. It was a DVD that was on my Christmas list, and Lisa got it for me. It’s called The Gallant Hours, a film from 1960 starring James Cagney. 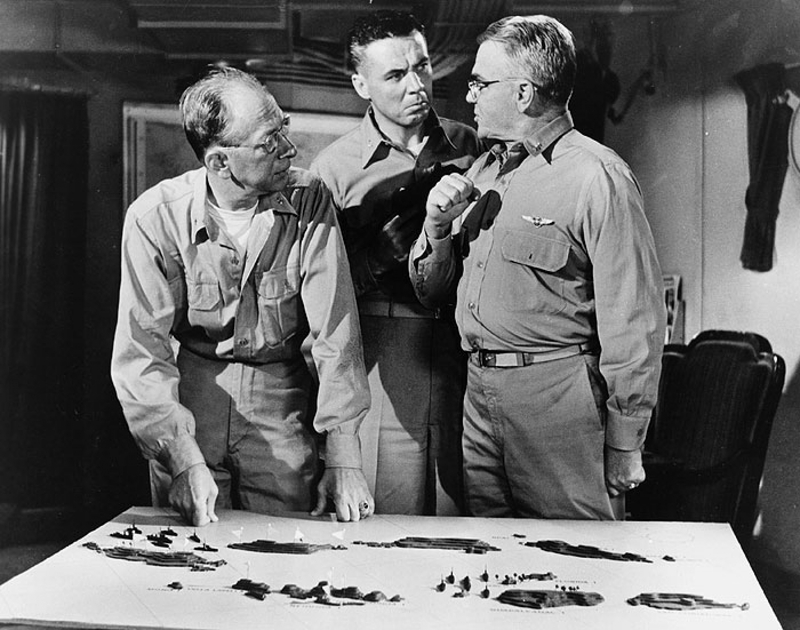 Cagney plays U.S. Admiral William Halsey, and the movie tells the story of the Allied victory over Japan in the Battle of Guadalcanal in 1942. At the beginning of the movie, Halsey is promoted to commander of the Allied forces in the South Pacific. Things have not been going well for the Allies: Japan defeated the U.S. at Pearl Harbor and then Bataan, and the U.S. is now in danger of losing Guadalcanal, too. So Halsey implements a go-for-broke plan to defend the island until they can get reinforcements—in a battle that proves very costly. Dozens of U.S. planes are shot down; dozens of ships are sunk—including an aircraft carrier; hundreds of ground troops are killed. After the battle, Halsey meets with his top advisors. He asks them for their assessment of the battle. And they’re all grim-faced as they recount all the losses they suffered. They think they’ve failed. One of them even suggests an evacuation plan for the island. But Halsey asks them, “What was our mission here? To hold on to Guadalcanal. And that’s exactly what we accomplished… No, the way I see it, we fought them to a standoff, and it couldn’t have come at a better time.” And he smiled as he said it. A standoff. That doesn’t sound very glorious, does it? A standoff won’t win Halsey another star on his uniform. But he didn’t care about stars on his uniform. He cared about one thing: accomplishing his mission. He was too focused on his mission to worry about personal glory. And that’s the way John the Baptist is. “Who am I? I’m nobody. But let me tell you about the Son of God. He’s somebody. He’s the one who deserves all the glory. Not me.” If John the Baptist were alive in the twenty-first century, we would diagnose this kind of humility as a problem; we would say he suffers from “low self-esteem.” But that’s not it at all. It’s not that he has low self-esteem; it’s that he has high self-forgetfulness. What did C.S. Lewis say? Humility isn’t thinking less of yourself; it’s thinking of yourself less. In another scene in that movie, Halsey talks to a pilot who tries to resign as squadron commander because he lost half his men in the battle—nine out of eighteen pilots. This pilot feels like a failure—like he’s not cutting it as a leader. Halsey reminds him, “You lost nine pilots—well, I lost those same nine pilots!” And he proceeds to list all the other people and ships and planes that he also lost in the battle. I think many of us can identify with this pilot. He’s beating himself up; he’s angry and disappointed with himself; he won’t forgive himself for his mistakes; he won’t cut himself any slack. Unlike John the Baptist, you see, this man really is suffering from low self-esteem. Which just goes to show that having low self-esteem is every bit as prideful as having an inflated view of yourself. Why do I say that? Because think about it: when you beat yourself up, when you’re angry at yourself and disappointed in yourself, when you won’t forgive yourself for some mistake you made, you’re only able to do that because your ego is still at the center of your life! You’re still putting yourself first! In order for your pride to be so badly wounded that it’s causing you to beat yourself up it means that you have to have pride in the first place. Your problem is you’re still imagining that it’s all about you. And remember what John the Baptist teaches us: It’s not about you… or me. It’s about him. It’s about Jesus Christ… It’s about his glory. Not your own. That’s almost right, except I would put it like this: There are no great men or women. There are only great challenges, sent to us by God, which God uses to force ordinary men and women like you and me to meet—by trusting in his grace alone. In 2016, will you meet that challenge and be that man or woman? If you’ve accepted Christ as Savior and Lord, you’re no less on a mission fro God than John was. And just as John was sent by God to do his work, you’re also sent by God wherever you go. And just as John was called to testify about Christ, you’re also called to testify—through your words and actions. This entry was posted on	January 4, 2016 at 5:49 pm	and is filed under Uncategorized. The closer we become to Jesus, the more we see our faults. After all, we are comparing ourselves to perfection. There is a danger of beating yourself up when you see this gap between who we should be and who we are. Rather than a beat down though, Jesus wants for us to bring our faults and our shortcomings to him. He wants for us to lay those imperfections on him, because he already paid the price for them. It is my experience that the only way I can do this is in a posture of utter humility. I come to him in shame and he says, “Don’t worry. I’ve got your back on this one”. I come away with the joy of forgiveness. This is peace that surpasses all understanding. Thank you for those thoughtful words, Grant. Amen. Brent, I agree that God’s glory is the principle thing, and that God has a plan for us, even though he knows we will mess things up in the process. So we can take heart in that. As you also know, though, from other comments, I think there is a place for “evaluating ourselves,” with resulting “credit” or “blame,” including a recognition that some of the things that happen to us are “consequent” to those “achievements” or “sins.” So I do think there is a place for “sorrow” in the Christian life, so long as it is “Godly sorrow” that does not lead to despair. Thus, Peter went out and wept bitterly. Then he was “restored” by Jesus at the lakeside, and came through really strong with the Spirit’s help at Pentecost. From another vantage point, Paul tells us that how we build on the foundation will result in rewards, “but if any man’s work gets burned up, he will suffer loss, yet he will [still] be saved, albeit as one escaping through the flames.” So clearly what we do has consequences for us, some of which can be negative. We won’t mess up God’s plans, but we might get ourselves “lesser roles” in the play depending on what we do. “If you remain silent, salvation will come through another source, but you and your house will perish. But who knows whether you have come into the kingdom for such a time as this,” Mordecai tells Esther. I agree completely. Are you referring to the part where I talked about how God redeems even our self-inflicted wounds (caused by sin)? My point is not to say that because God redeems them the outcome is exactly as if we didn’t mess up. By all means, God’s plans for us would be even more “glorious” (if you want to think of it that way) if we weren’t disobedient. But even when we are, we, his children, can be confident that he foreknew that and is still working for our good, even when we suffer the consequences for sin. Being disciplined by God is a wonderful thing, after all.